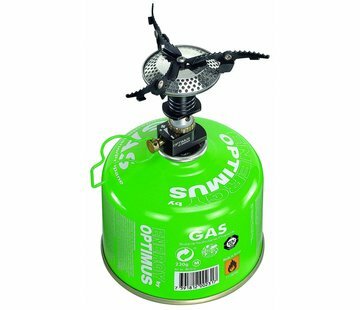 Optimus Crux Lite Solo Stove. The compact and ultra-light cooking system combines the `Crux Lite´ gas cooker with the Solo cook set in hard anodized and nonstick coated aluminum. Pot with pourer and gradations (ml and ounce), frying pan/lid, a mesh sack and a nylon pouch for the `Crux Lite´ cooker. The set offers space for a 100 g gas cartridge and a folding Spork (both not included).